Couples seeking an elegant, romantic getaway have countless options in the Caribbean. Whether you’re considering a destination wedding in an exotic location, hoping to jet off to some island paradise for the most luxurious of honeymoons or simply needing to unwind with your significant other in the sun and sand, these island destinations are sure to please the most discerning of travelers. Branded the St. Tropez of the Caribbean, Saint Barthélemy (better known as St. Barts) is an island reflective of haute Europe in the laid-back Caribbean. This celebrity-studded, French-speaking island is the place where A-listers flock. Across this well-manicured island, the daily agenda rarely strays from sun worshipping, fine dining and yachting. A stroll through the harbor city of Gustavia, the island’s picturesque capital, is home to the world’s finest shopping districts with luxury outposts such as Cartier and Louis Vuitton, as well as dozens of boutiques. Set sail on a state-of-the-art yacht or catamaran for an afternoon of Champagne toasting and snorkeling on the secluded Colombier Bay. Private charters are the norm, but outfitters also offer reasonably priced group trips that include open bar. Watch the sunset over St. Jean Bay at star chef Jean-Georges Vongerichten’s celebrated On The Rocks restaurant, and party into the wee hours with the rich and famous at Le Ti St. Barth, a fabulous boudoir-themed club. Rest your weary head at Hotel Taiwana or Hotel Christopher, and you’ll wake up to stunning beaches, lush gardens and a tropical chic aesthetic. With a beautiful landscape filled with volcanoes, cloud forests and unfussy vibes that foster an ambience of complete escapism, Nevis is also home to the Caribbean’s sole Four Seasons resort, as well as nearly a dozen 18th-century sugar mills reinvented as rustic inns. Days on Nevis involve little more than ambles on pristine beaches, long naps in a hammock, exploring the mountainous terrain (keep an eye out for the monkeys) and self-guided tours to the rock-hewn relics of the sugar cane industry. Get to know some of the locals at one of the cozy roadside restaurants that serve up hefty portions of stewed salt fish, coconut dumplings and pelau–a spicy fried rice with meat, pigeon peas and veggies. Just a couple of miles across the channel from Nevis lies St. Kitts, a treasure trove of history, activities and beautiful scenery. Rent a car to spend a day exploring the Georgian architecture of Basseterre, the capital, and the pastel-hued villages that dot the island’s principal highway, or take a horseback ride along Frigate Bay. When planning a romantic getaway to this Caribbean island, consider staying at the Belle Mont Farm. Located on Kittitian Hill, this luxury resort is surrounded by 400 acres of lush rainforests and untouched beaches. On-site amenities and perks include Irie Fields, a Par 71, 18-hole golf course that embraces its natural landscape with fresh fruit. The Mango Walk Wellness Centre offers private spa experiences such as custom body scrubs produced from locally sourced herbs. If you want to maximize your time alone, the Nisbet Plantation–the Caribbean’s only historic plantation on a beach–features private accommodations and is a prime spot for a destination wedding or honeymoon. St. Kitts’ pristine beaches and scenic, coastline-hugging railway make this a perfect island getaway. For couples seeking a tropical and exotic getaway, St. Lucia does not disappoint. Be sure to spend time at the most romantic spot on the island – Soufriere Bay. The island’s idyllic white sand beaches and Pitons provide stunning landscape views you won’t find anywhere else in the Caribbean. Jade Mountain is the epitome of romance with amazing views of the Pitons, where guests can discover the secrets of chocolate making. This Caribbean resort features its own chocolate lab, where the finest chocolate is produced on its own organic Emerald Estate in the Soufriere Hills, making this experience truly exotic and tasty for chocolate lovers and romance seekers alike. Split your stay between the Rodney Bay area to enjoy dining on Lucian specialties such as crab back and salt fish at the marina, and the south end of the island, where the majestic Pitons are located. In addition to Jade Mountain, the Ti Kaye Resort & Spa, the Harbor Club in Rodney Bay, Viceroy Sugar Beach, Anse Chastanet Resort and the Capella Marigot Bay Resort & Marina all come highly recommended. 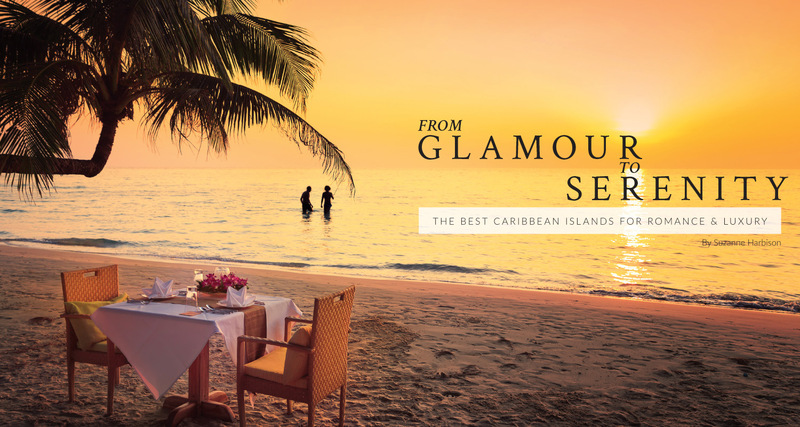 Explore our agency’s range of romantic escapes in the Caribbean with special savings and perks.